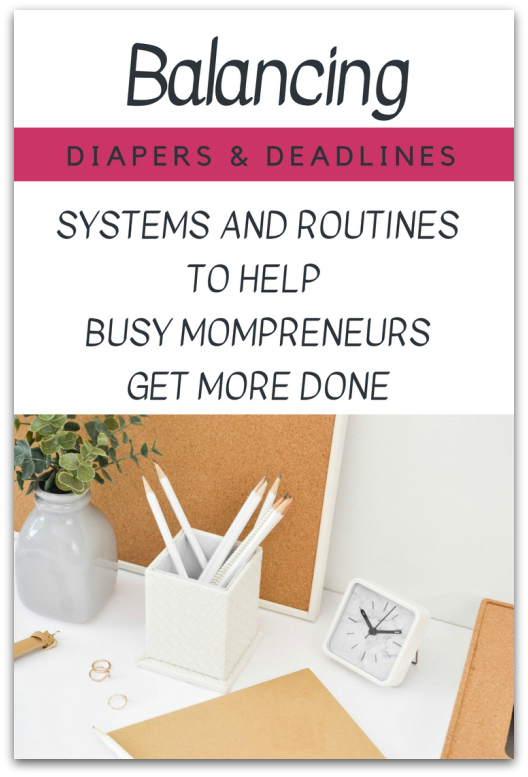 This month, I worked through the Balancing Diapers and Deadlines course from Lisa Tanner Writing. As you can guess from the title, it is a course about work-life balance, specifically for the work at home mom. But I think it is beneficial for all moms because we have to balance marriage, kids, and a house whether we are working or not. There are eight units in the course that you can work through at your own pace. Each unit works through a different area of your life; making goals for your business and getting your family on board, laundry, chores, meal planning, growing your business with kids underfoot, and boosting productivity. Each unit is broken into a few lessons and each lesson has an action step. Early in the course, one of the action steps is to do an email check in with Lisa. She actually responded to my email within 24 hours with encouragement and specific, actionable ideas for me. She has several ideas for both laundry and meal planning. If you don’t struggle with those areas, you can skip those sections of the course. But if you are feeling overwhelmed in those areas, she has some wonderful suggestions. She has 5 years of annual meal plans available in the course. I like her idea of planning lunch. I always think about breakfast and dinner and don’t plan lunch so we end up winging it. This means that our meals in the middle of the day are not as healthy because it’s whatever I find. I also like her idea of a set time for certain chores. Morning chores are done after breakfast. Table chores are done after each meal. Lisa has a lot of great ideas. She is a mom of 8 so all of the ideas work really well for large families. She gives suggestions for if you have fewer kids, but I really think this course is better for larger families or moms who feel overwhelmed with housework. Since Clarissa is my only child right now, some of it doesn’t really apply for me. More than half of the course was really about getting your household running well with chores, laundry, and meal plans. The other units were about building your business. She talks about self care. “Learn what relaxes you, and make it a point to do that on a regular basis…even if it’s just five to ten minutes per day.” She has a great list of things you can pay other people to do so that you can focus on your business like grocery pick up, housecleaning, etc. Lisa did inspire me to write more consistently on my blog. We are getting into a groove where Clarissa will let me write for a small block of time each day. Time blocking a to do list did help me to accomplish more in a day or at least have a more realistic expectation of what could be accomplished on that particular day. Throughout the course, she has great downloadable lists for things like: chores your kids can do, what your kids can do during quiet time, and what a family writing time can look like. Each list is broken down into specific age groups to make it easy to find something for your specific kids. You can email Lisa again for another check in at the end of the course. This course really did help me to find a focus for my blog and my writing. It helped me to really sit down and make some goals and plans for 2019. Due to the time constraints of writing this review, I feel like I rushed myself going through this course. I think I will go through it again slowly when Clarissa is a little older or if I do actually do need to earn an income from home. Fifty five women reviewed this course, so if you click on the link below you can read about their experiences as well.